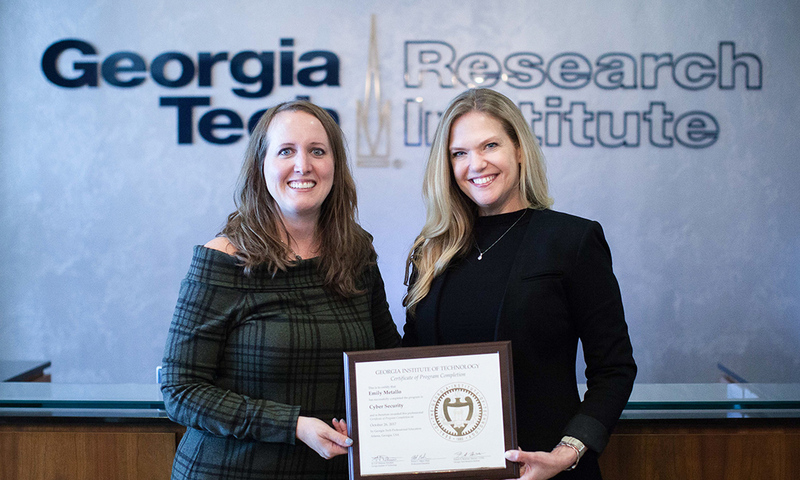 Georgia Tech Professional Education enables working professionals to acquire cybersecurity expertise from research engineers at the Georgia Tech Research Institute. Courses benefit decision makers, project managers, network defenders, and others who want to gain a wider perspective. Because the cyber landscape changes rapidly, courses focus on building long-term cybersecurity proficiency based on fundamental knowledge and critical thinking skills. Students attest that the courses enable them to better identify appropriate measures to take within their unique situations. All courses earn continuing education credit and count toward the Georgia Tech Cyber Security Certificate. For more information, contact Renita Folds (mailto: renita.folds@gtri.gatech.edu) or visit Georgia Tech Professional Education. Do I have to apply to Georgia Tech and be admitted as a student? Traditional college applications and entrance exams are not required. You will participate as a non-degree-seeking student of Georgia Tech Professional Education. How long does it take to complete the Georgia Tech Cyber Security Certificate? Most students finish within a year, but you may take up to six years to complete the requirements. The certificate is awarded after you have successfully completed the core course ("Cyber Security: A Systems Approach") and four electives. Do these courses count toward a Georgia Tech degree? All students of Georgia Tech Professional Education earn continuing education units (CEUs) for successfully completing a course. CEUs may count toward a certificate from Georgia Tech Professional Education. Who teaches cybersecurity short courses? Georgia Tech Professional Education courses are taught by cybersecurity researchers -- the same faculty who teach Georgia Tech's nationally ranked Top 10, on-campus degree programs as well as the research scientists who work in Georgia Tech's 12 cybersecurity labs. They are individuals who are actively leading, teaching, and researching cybersecurity solutions now for military units, federal agencies, and Fortune 500 global organizations. How long are cybersecurity short courses? Most short courses are taught across two or three contiguous days. Many of the short courses are available as public offerings that are taught in midtown Atlanta at a Georgia Tech building. Courses also may be arranged as private offerings for a group of colleagues. Instructors will travel to your workplace or another training location to teach a private group. Do courses have to be taken in a particular order? It is recommended that you first take "Cyber Security: A Systems Approach," however students may choose to complete the courses in any order that best suits their schedules, immediate learning goals, and prior experience. Any prerequisites are listed on the course description page, but most courses contain recommendations rather than prerequisites. For example, some courses recommend that attendees have prior programming experience. Students with no programming experience still may enroll, but they may have difficulty completing the lab assignments and may find some of the material outside of their comfort areas. All courses are offered in a live, face-to-face, classroom format only at this time -- either in Atlanta or by special arrangement at your worksite. Is there a test or final exam? All certificate programs under the oversight of the Georgia Board of Regents require an assessment component. Each course includes an assessment. These assessments commonly are short, open-book, multiple-choice quizzes that verify that you understand and can apply the key concepts.